Last week, New-York based agency broker, Instinet launched RQ Connect, an application within its research payment and commission management platform, which allows integration of data from third-party or proprietary research budgeting or evaluation tools. 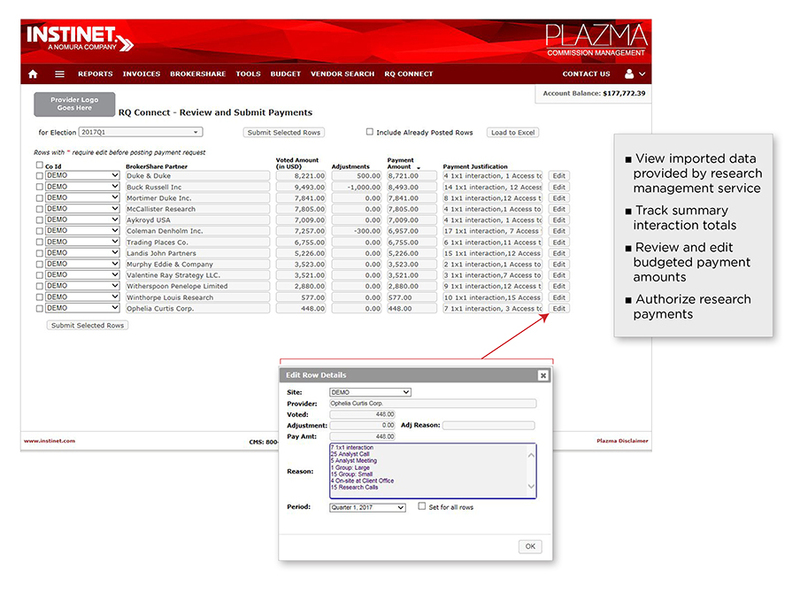 Instinet’s new RQ Connect (Research Quality Connect) application enables asset managers to use internally developed or third-party research budgeting, evaluation (broker vote), or interactions tools and integrate this data into Instinet’s Plazma commission management platform to make unbundled research payments as required under MiFID II. A number of third party research management service providers that are already integrating their data feeds into RQ Connect, including Alphametry, Castine, Commcise, CorpAxe, Dealogic, FactSet, ResearchPool, RSRCHXchange and Visible Alpha/ONEaccess. Instinet’s new RQ Connect application makes sense as it allows buy-side clients subject to MiFID II to select whatever research budgeting and evaluation solutions they think are best, while still using Instinet as their RPA administrator. Consequently, this application provides tremendous flexibility for asset managers – they can either use Instinet as an “end-to-end” provider or they can use other vendors while using Instinet just to manage research payments. However, Instinet’s “open architecture” approach has not been adopted by all of the other RPA administrators. Based on the analysis we conducted for our recent MiFID II Research Solution Providers study, two of the six firms offering RPA Administration services (Bloomberg Tradebook and Liquidnet) are only planning to offer these services to existing customers. Consequently, it is unclear whether they will provide RPA administration to asset managers who use other firms’ research procurement management tools. While Instinet plans to integrate other providers’ solutions in the coming months, we expect that competing RPA Administrators are likely to launch similar “open access” modules enabling clients to select best of breed solutions to meet their MiFID II research unbundling and payment obligations.